I'd pull out the Art Of Rogue One and Art of Solo books, to get ideas from the production drawings. And depending on the plot, I'd look toward war movies. Maybe not Saving Private Ryan, which everyone knows, but a movie like Robert Aldrich's "Attack!" or "The Dirty Dozen" which are character pieces that just happen to take place during wartime. Another good war movie for inspiration, would be Bruce Willis's Tears of the Sun.. The Guns of Navarone. Sneak into a base and destroy the super guns. 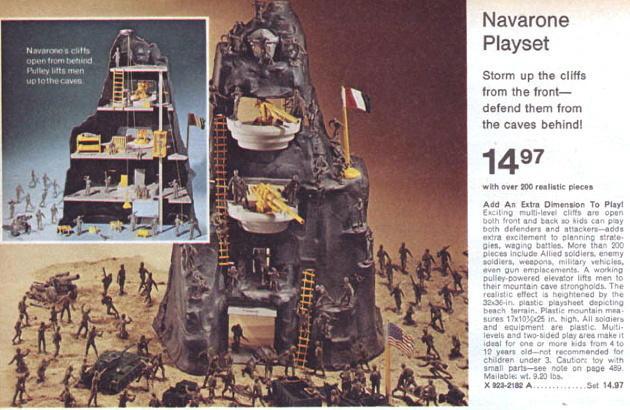 I had this Navarone army men playset when I was a kid. The Nazis were light grey. They even had goose stepping ones.